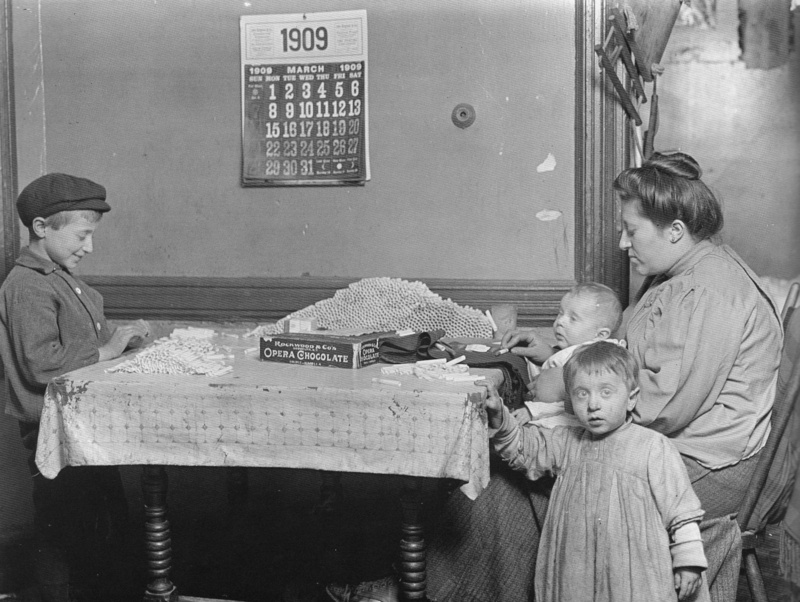 In turn-of-the-century New York City, even young kids did their share to help the family finances. If a poor immigrant family worked a trade at home, small hands were there to assist. Above, photographer Lewis Wicks Hine captures an immigrant widow and her son rolling cigarettes in 1909. I love his brother in the dirty garment, his ears rather Spock-like, staring with suspicion at the camera. The picture comes from Historic Photos of New York State, a just-published collection with lots of wonderful shots of city life over the years. 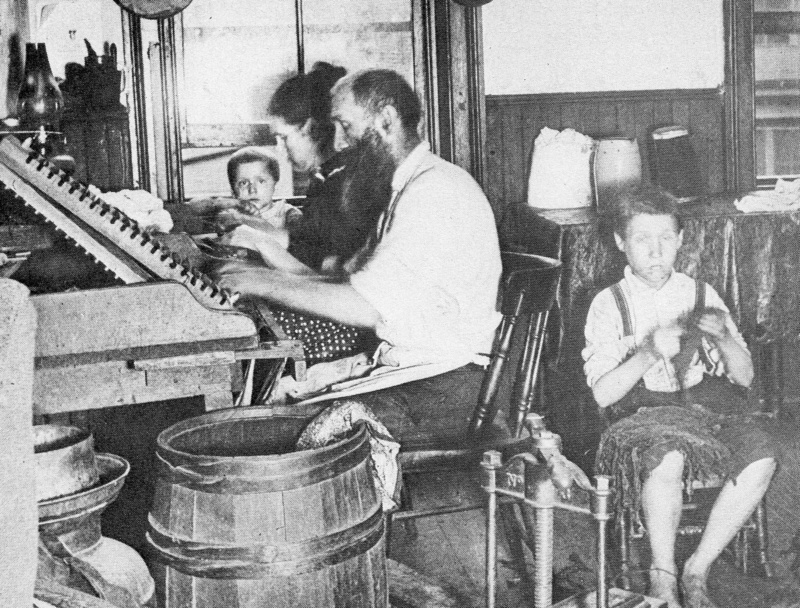 Jacob Riis also photographed an immigrant family from Eastern Europe plying their trade, cigar rolling. The undated photo above is part of the Jacob A. Riis Collection at the Museum of the City of New York. I imagine these families were replaced by machines not long after the photos were taken. This entry was posted on September 17, 2009 at 5:59 am and is filed under Lower East Side. You can follow any responses to this entry through the RSS 2.0 feed. You can leave a response, or trackback from your own site. I think there’s more prestige in cigar rolling. Cigarette rolling not so much. I think cigars have to be rolled by people. At least, no machine thus far invented is sufficiently careful with the tobacco (as opposed to paper in the case of cigarettes) wrapping as well as cheap enough to be economic. There are cigar rollers at work in the cigar shop round about 37th St. and 9th Ave. I love the calendar hanging on the wall. I know! I love that it includes info on the phases of the moon for that month. Thanks for the link BB. There used to be a newer cigar roller on church st in tribeca a couple of years ago. Not sure if he is still there. Yes, indeed they were Eastern European workers. Apparently, according to Riis, many were Bohemians. Top photo: The child “in the dirty garment, his ears rather Spock-like, staring with suspicion at the camera” reminds me of the comic-strip character from that era, the Yellow Kid — but with hair. In cowboy movies, they pronounced ‘cigar” as ‘cee-gar, or ‘see-gar’). I guess it was the Southern or Spanish or old-fashioned way of pronouncing it. “Ceegar” is the way a Spanish person would say it, and Cubans make cigars. When cigarettes became popular, maybe that pronunciation (cig – ar) replaced the older ‘cee-gar’.